Rumors about the alleged Samsung Galaxy F have bee circling the web for a while now, and recently, we got to see a glimpse of the device’s aluminum frame and a couple of days ago, @evleaks posted another photo showing off the Galaxy F’s front side. Leaked photo of the Galaxy F.
The guys at GSMArena have an inside source that claims that the phone’s removable back is made of plastic, but that the frame is identical to the latest iPhone’s. In terms of specs, the Galaxy F is rumored to come with a 5.1in QHD Super AMOLED display, a resolution of 2560 x 1440 pixels and a quad-core Snapdragon 805 processor. Other rumors include 3GB of RAM, 32GB of built-in storage plus a microSD card slot (up to 128GB). On the phone’s back should be a 16-megapixel camera, and in the front, a 2-megapixel shooter. The smartphone is expected to run Android 4.4.2 KitKat. The Galaxy F should also share some of the Galaxy S5’s features, such as the fingerprint sensor and the heart rate monitor. Hopefully, we’ll get the official details about this handset from Samsung soon enough. 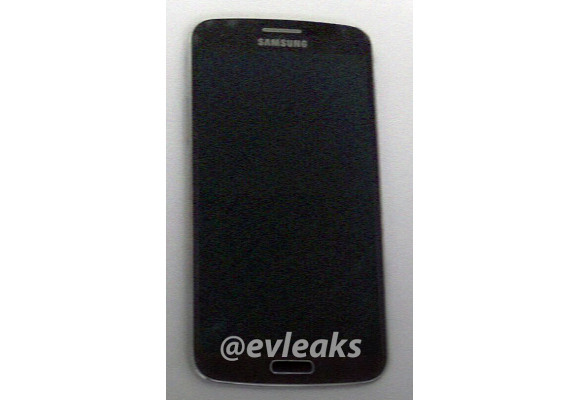 This entry was posted in Uncategorized and tagged galaxy f, leaked, photo, Rumors, Samsung, smartphone, specs. Bookmark the permalink.